Visual pest bird scaring (live and dummy predator birds). Dummy predator birds, such as life-sized plastic replicas of North American eagle owls, and flying falcons are often used. You will likely already be familiar with visual bird scaring systems- you just might not have heard their proper name used before. The most common form of these systems is dummy predator birds, typically a hawk, falcon, or other common bird of prey. When pest birds see these dummies, they are naturally quite alarmed, since these predators would ordinarily prey on other species of birds. Visual bird scaring systems are one of the most common methods of pest bird control, being widely used in areas such as train stations and stadiums where nets would be difficult to implement properly. When used properly, they can prove to be highly effective- but as we will see, this isn’t always the case. All too often, people leave dummy predator birds on a ledge and expect them to simply work forever. However, in reality, this is far from the case. If the dummy remains fixed in one place, then pest birds will quickly become accustomed to them and ignore them. We have even had reports of pest birds using these dummies as a perch- a clear sign that they aren’t being utilized properly. However, these dummy predator birds can be extremely useful when they are merely one part of a wider scaring strategy. By using dummy predator birds alongside an audible pest bird scaring system, pest birds will come to believe that it is a real predator and therefore stay well away. In addition, frequent relocation of the dummy will also help to stop pest birds from becoming habituated to them. Dummy predator birds aren’t the only form of visual deterrent, though. Another option is to fly a live predator bird, such as a Harris hawk, to scare pest birds away from infested areas. Many people are impressed with the apparently immediate effect of this form of pest bird deterrent, but this is only due to the immediate presence of the Predator Bird. There is no question that the use of live predator birds can be effective. However, this method needs to be carried out consistently in order to keep pest birds away in the long term. If the pest birds see that the predator hasn’t returned in a long time, then they will soon return to your property. To deliver the best results, live predator birds should be utilized only as part of a wider-reaching programme of bird deterrent measures such as audible pest bird scaring and/or proofing. 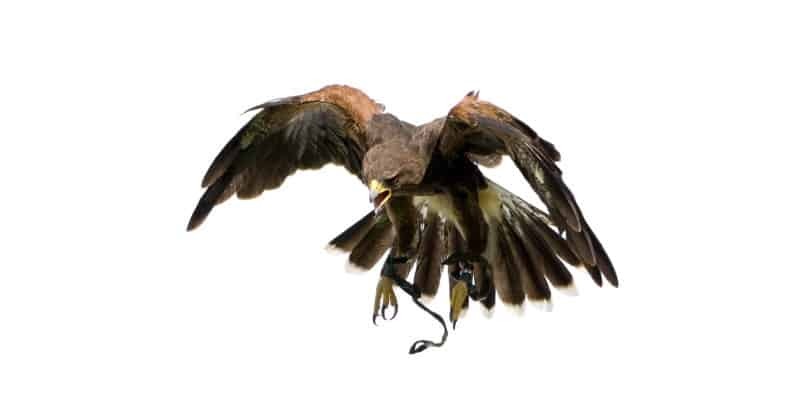 Of course, most people don’t have easy access to Harris hawks- and that’s where Pest Solutions can assist you. As pest bird control specialists, we offer a wide range of different solutions, including visual systems. From dummy predator birds to flying live predator birds, we provide an expert approach to pest bird control. What’s more, our high level of experience and top qualifications mean our pest control team know how to get the best results out of any approach, so you always get great value for money with our services. Our expert team of pest bird control specialists are highly trained and experienced, so you can rest assured that they will do a thorough job of dealing with your pest problems. Before we begin work, we are pleased to offer a free, no-obligation survey to help you make the right choice when it comes to pest control. That way, we can take a close look at your property and come up with a tailored solution designed to meet your unique needs. Call Pest Solutions to Get Rid of That Pest Today! Extensive UK coverage from our many local regional branches gives Pest Solutions the capability to react speedily to assist you to take care of your unwanted pests today. We can install visual bird scaring systems fast to provide instant results and start tackling that pest bird infestation right away. Call today to get an experienced Pest technician visit and get that Pest problem under control quickly. To have a member of our Pest Control service team carry out a FREE survey or a service visit today phone 0800 027 2555. Alternatively click here to find the details of your local Pest Solutions branch. Click here to request a FREE Survey Today! Get a FREE survey now! I want to receive marketing communications from you (you can change your preferences at any time).